Little Miss Sunshine Japanese movie poster (B1 size), originally uploaded by japanese-movie-posters. There are at least two variants for Little Miss Sunshine, at least in the larger B1 size. They are fairly similar except that this one features portraits of the cast. This is a hard poster to find even though the movie recently came out. I’m trying to pick these new releases up as soon as I can. The Trip Japanese movie poster, originally uploaded by japanese-movie-posters. I acquired this poster this year, and I can’t say that I had been looking for it. I’ve previously seen and owned another B2 design for this film, as well as the 2 panel (I have another 2 panel coming very soon). But this one — I had never even seen an image of before, so when it was offered to me I knew I had to pick it up. Certainly the art on this Japanese poster fits with the film! A very cool and rare piece. 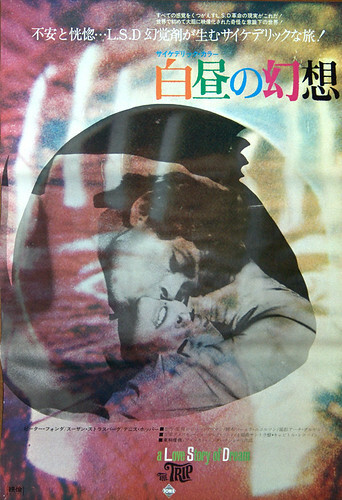 La Chinoise R80’s B1 Japanese movie poster, originally uploaded by japanese-movie-posters. This isn’t a new addition to my collection, but it is such a cool piece regardless. It’s an 80’s re-release for La Chinoise and is pretty scarce. I have seen only three, one of which had a huge tear in it. For a poster from the 80’s that is just not too many sightings over a period of eight years. And I am always actively searching for these. 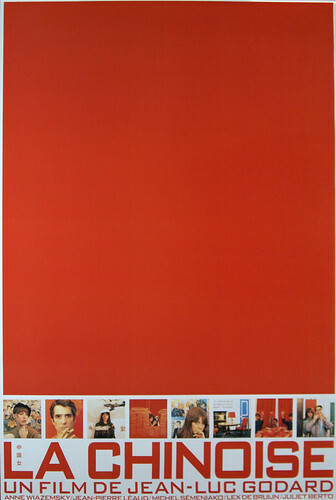 Some have commented that the poster is boring because of the large red field. I think it’s brilliant. One of my favorites. Dark Knight B1 Advance screening, originally uploaded by japanese-movie-posters. I’m not a rabid Batfan and I am apparently in the minority in saying that I think the first Nolan film is the better of the two. End of disclaimer. This poster is really interesting — first off, this is the first time that I’ve seen this setup where the top and bottom of a single poster are meant for two different openings. One part (you can’t really say top or bottom since the poster is largely symmetrical, with credits on both sides) is for a limited advance screening on August 2/3, while the other part is for the wide release of August 9. 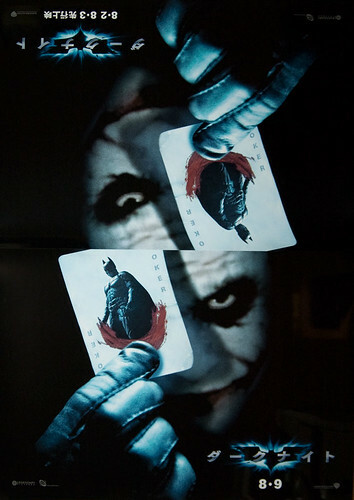 The poster was meant to be folded or cut at the middle for each respective release — how do we know this? The poster was lightly mechanically scored on the back to facilitate this action. But what I really like is the unusual paper. It is thick and very very shiny. Glossy, almost to the level of new car paint. You can see some reflections in the right side of the picture. Cool poster. Bruce Hershenson has 500 Japanese posters on auction right now, ending next Tuesday. For those that don’t know emovieposter.com, the site is run by Bruce Hershenson and is a great operation. Bruce is one of the “good guys” in the hobby and I actually met him last year and toured his facility and met some of his staff. And it is a real FACILITY — I think it’s about 5000 square feet and jammed to the gills with posters. Anyway, if you go through the auctions this week there are some interesting items in there. 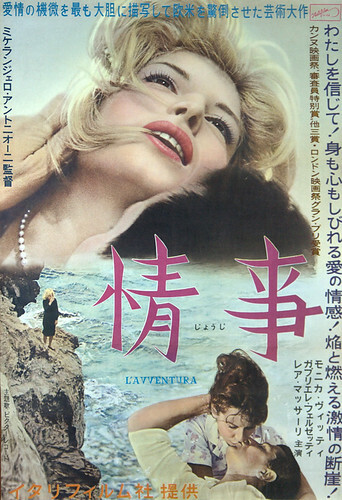 lavventura-japanese-B2, originally uploaded by japanese-movie-posters. I recently received this one from Japan. Featuring a fantastic image of Monica Vitti, I think it is probably the second best design for Michelangelo Antonioni’s L’Avventura after the French 1 panel. Probably off to get linen-backed by Vintage Movie Art…. Hope you enjoy having a look. Les Plus Belles Escroqueries du Monde Japanese movie poster, originally uploaded by japanese-movie-posters. Another beauty from this rare title. Yes, the tatekan is SOLD, but this B2 is still available. I’m still contemplating putting this one on linen and making it part of the permanent collection. It’s such a cool piece. LOVE IT.